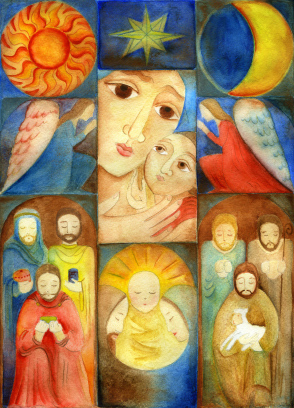 Begin your preparations for Advent and Christmas with resources from Faith & Leadership. These sermons, essays and stories invite you into the wonder, challenge and messiness of first a season of waiting and then a season of light and joy. To put on the joy of the Christmas season, first there are things we have to take off, says an Episcopal priest. Shopping should be the last thing on the Christmas to-do list, writes the Christian history scholar. Instead, the lectionary readings stress repentance. That means ’tis the season to feed the hungry, be satisfied with what you have and live with the end in mind. The executive coordinator of the Cooperative Baptist Fellowship reflects on spiritual practices that help him experience holy moments in the busyness of Advent and Christmas. Scripture is astonishing and exciting. So read it that way, says speech coach Christine Parton Burkett. She offers practical advice on how to avoid “stained-glass voice” when delivering familiar Christmas texts year after year. This script combines selected verses from Matthew 24, Luke 2, John 1 and Revelation 19 for dramatic presentation. Lillian Daniel: Advent and Christmas -- Can’t we do both? You don’t have to choose between Christmas and Advent. Just make sure you pay attention to both. Jenny Williams: Is it ‘the holidays’ or Advent? Small practices can allow us to reclaim Advent as a preparation for Christ rather than a season of consumerist busyness. Youth ministry isn’t about helping young people create a successful future but about standing with them, waiting for the fullness of God’s action. A youth ministry scholar and author of “The Relational Pastor” reflects on Advent, eschatology and young people. After recalling the frenetic pace of past Christmas seasons, a writer commits to celebrate Advent as it should be -- a time to embrace desire and hope. On the fourth Sunday of Advent, the story of Mary and Joseph shows the importance of saying yes to God. The right yes is necessary if God is to partner with us in the economy of salvation. The Catalan nativity tradition of El Caganer -- politely translated as “The Pooper” -- reminds us that God loves us in all our messiness. For a former vicar of an urban church, a real-life reminder of this messiness was also a call to work with the homeless. The search for a church committed to racial reconciliation didn’t go quickly. But the waiting for it, like the waiting of Advent, was a time to learn to love God and neighbor and find miracles in small and surprising places. The cult of consumption requires more than the occasional Advent sermon cautioning against “losing the real meaning of the season.” What if Advent became a season of baptismal renewal? In Apex, N.C., and across the country, churches are using the Latin American tradition of Las Posadas to connect people to Hispanic culture and the Christmas story -- and to spread the message of hospitality. How do you live out your Christian values during the holiday buying frenzy? For one family, the practice of limiting gift giving to three presents has brought a needed discipline to Christmas. As Christmas reminds us, God has been mixing it up with matter from the beginning, and our calling is not to liberate light but to embody it, to work alongside God to knead light into clay, says the philosopher and theologian. End-of-the-year tasks can pull Christian leaders’ attention away from what really matters during the Christmas season. But a Methodist minister finds that even when he is not attentive, God still comes. In this pastor’s family, Watch Night means singing and praying out the old year and welcoming with joy the new year. Whether at church or at home, they gather and God visits. Timothy Larsen: It’s Christmas. Time to break out the Santa figurine. Holiday traditions, whether time-tested or personal, bring a cyclical certainty to linear time. For 18 years, the Sixty-First Avenue United Methodist Church in west Nashville has operated the Last Minute Toy Store, a powerful sign of this small congregation’s incarnational presence in the world.